MovingGiants.org | Blog - Elephants Are Being Killed By Trains. This Organization Has A Plan To Stop It. Elephants Are Being Killed By Trains. This Organization Has A Plan To Stop It. This is a guest post from Sri Lanka Wildlife Conservation Society. 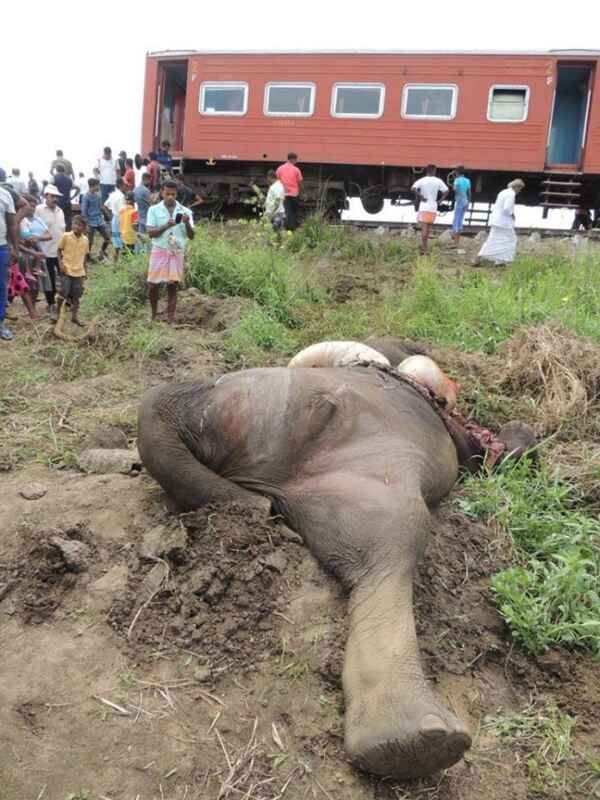 Recently there has been an increase in the incidents of trains colliding with and killing elephants in the North-central and Eastern Provinces of Sri Lanka. According to the Department of Wildlife Conservation and the Minister for Wildlife this year so far twelve elephant had died killed by trains and a total of 83 elephants had died from past incidents. In the aftermath of these unfortunate incidents there have been many suggestions. These include creating high tech sensors and early warning systems to offer safe passage. While going high-tech or providing safe passages sounds theoretically effective and attractive it would be rather prudent to find a simpler solution that is low maintenance and easily enforced and implemented, and sustainable over the long term. Any solution that is adapted needs to be based on the railway traffic code and easily understood by the train engine drivers as well. 1. The speed at which trains travel through sections that go through elephant corridors where elephants are known to cross the tracks. 3. Some engine drivers operate trains under the influence of alcohol. 1. Early warning systems. Such systems have to be piloted to confirm their efficacy. Also elephants become inured to repetitive warning sounds after awhile and ignore such warnings. 2. To build underpasses and overpasses. The cost to establish these safe passageways would be exorbitant. It is doubtful that the State would provide the money to build them. Also there is no guarantee that elephants would use them and, even if they do, not all elephants will use them. So whether they will stop elephants getting hit by trains cannot be guaranteed. 3. Bio fencing. It takes a long time for bio fences to reach maturity to be effective and again there is no guarantee they will work. Even electric fences have failed to stop elephants which were the case in Namalgama, Welikanda where three elephants were killed by a train in October of 2018. 4. Thermal cameras to detect elephants ahead and caution engine drivers to slow down. Apparently the forested and hilly terrain restricts the effective use of thermal cameras and they also provide false information such as showing heated granite boulders as elephants. Further engine drivers find it difficult to keep a constant eye on the cameras while operating the train. 5. Electronic fencing employing infrasonic and ultrasonic wavelengths repulsive to elephants and visual lightening effects to keep them away from railway tracks. Such technology does not exist and will take a long time to be developed, trialed and applied as an effective solution. The cost would be another factor including maintenance. Such systems have to be robust to work under harsh conditions with minimum maintenance. IMPORTANT: It is important to conduct research to identify the exact location and coordinates of the elephant corridors and elephant crossing points along the tracks to plan where to install the traffic lights. The solution proposed by the Sri Lanka Wildlife Conservation Society could be the most effective solution due to its simplicity. It could also be easily integrated to the administrative and operations policy framework and traffic code and regulations of the Sri Lanka Railways. Most importantly it would be easy for engine drivers to obey. Trains are controlled by their very own ‘highway code’ to keep them a safe distance apart. Railway lines are divided into sections called blocks where only one train at a time is allowed. Traffic light signals (either semaphore or color light signals) control trains, with signals showing cautionary yellow and customary stop and go, red and green lights. Trackside signals (either semaphore or color light signals) control the entry and exit from each block including the speed of the trains, warning trains when the line ahead might be occupied, and if they must reduce speed or stop. Just like on the road, along with the traffic lights there are speed limit signs signaling drivers to reduce speeds in built up areas and where there are hazards. ▪Green: Proceed at line speed. Expect to find next signal displaying green or yellow. ▪Yellow: Prepare to find next signal displaying red. Using traffic colour light signals would be the simplest of solutions to stop trains colliding with elephants in areas where the train tracks pass through known elephant corridors. Obeying traffic light signals and their rules and regulations are what engine drivers already know. 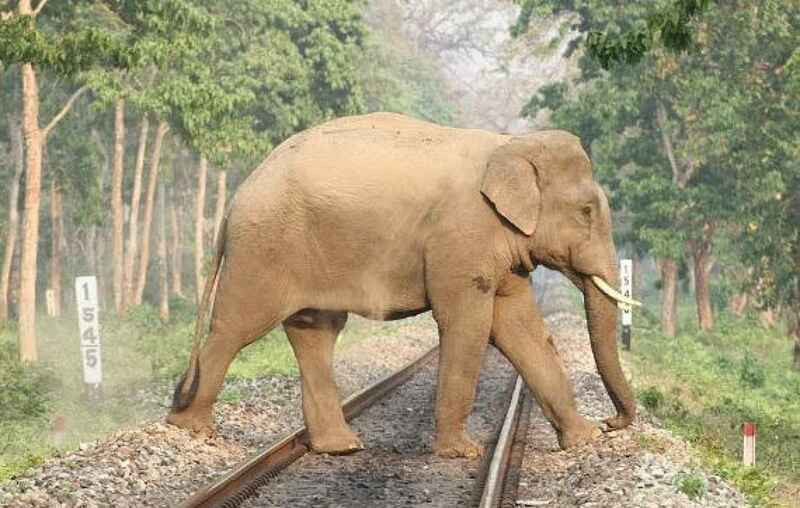 The Sri Lanka Railways needs to establish a Multi-Aspect Signalling method to stop trains colliding with elephants. The Multi and/or Four Aspect Signalling methods were developed to give advanced warning to trains traveling at or over 50 km/hour that there is a red signal ahead and to give the driver the room to stop. By placing a single or double yellow light placed far enough back from the red signal light protecting the entrance to the block ahead gives the driver a warning and a safe braking distance in which to stop. The caution “yellow” signal is provided a block further back from the “red” stop signal. Similarly a set of colour traffic lights at the approach to the blocks that pass through elephant crossing points along railway tracks and speed signs will not only warn but also indicate to the train engine drivers to reduce their speed to 10 km/hour. At this speed the train can be easily brought to a stop when elephants are spotted crossing the tracks. The train will maintain a 10 km/hour speed until it sees the “go” green light indicating that the train has now passed the blocks in the elephant corridor and can proceed as usual. The schematic diagram (Figures 1 & 2) below shows a railway line with a Multi Aspect signaling system installed. It shows how this system would work to stop trains colliding with elephants. The train travels at usual speed until it sees the double “yellow” light and speed signs which warns the engine driver that he is approaching an elephant corridor and elephant crossing point further ahead and to slow down and drive with caution. The single “yellow” light and speed signs inform the engine driver he needs to travel at a speed of 10 km/hour. The continuing “yellow” light through the corridor (whether elephants are present or not on the track) warns the engine drive to maintain the speed at 10 km/hour. The “green” go light indicates to engine driver that he has passed through the corridor and can resume usual speed. On a single line where inbound and outbound trains travel on the same set of tracks, a set of signal lights will be at each end of the blocks that go through an elephant corridor. The method outlined above is simple to implement and is based on the current train operating traffic codes and regulations. Therefore there is no need to provide engine drivers with training. The overall savings to the Sri Lanka Railways (SLR) and to the government of Sri Lanka would be tremendous considering the loss of revenue, damage to trains and tracks, loss of cargo, labor fees and the loss of elephants which is a valuable natural asset of the country. Installing this system will create a good publicity image for the SLR. In addition, with the trains going at slow speeds through elephant corridors, this could open up new economic opportunities, especially to promote elephant viewing from the train. As elephants begin to feel less of a threat from the slow moving trains they would become comfortable to stay within easy viewing distance. This would provide passengers traveling on the train a unique opportunity to obtain a new exciting wildlife experience. It could be promoted as a night safari by train. By providing several observation cars especially for the purpose of viewing elephants from the train and by launching a strategic publicity and promotions campaign, it would be possible to further increase revenue to the SLR. In other words, this would be a good example of sustainable development where a situation that caused severe economic and elephant losses is converted to a huge economic gain. If the SLR does not have the capacity to develop such a program it should consider outsourcing it to a private adventure and leisure travel company to create a high-end niche market tourism product.